There have been few—if any—composers in the canon who were more aware of their public image than Igor Stravinsky. 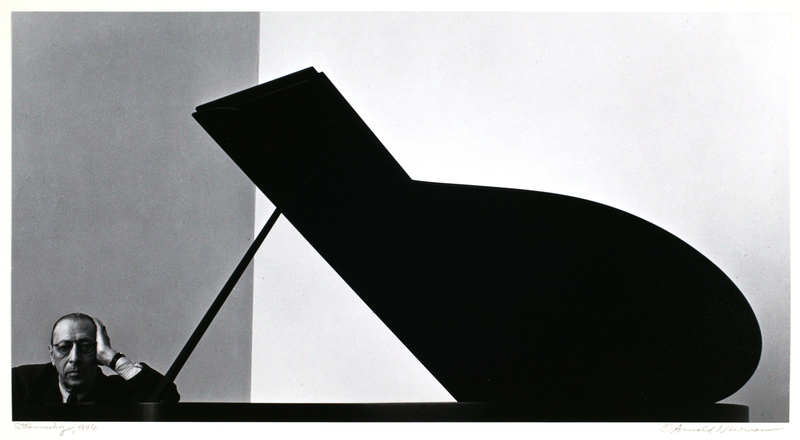 The classic 1946 portrait by Arnold Newman demonstrates this quite clearly, and will serve as our header image for the next couple weeks. Here is the photograph in full. Be sure to also check out this modernist, avant garde interpretation of Newman’s image. Here is the (belated) second set of music performances to go along with chapter 2. Click through below for more videos. It could easily be a stanza from Basho (or at least a snippet from Cage’s zen-inspired lectures). 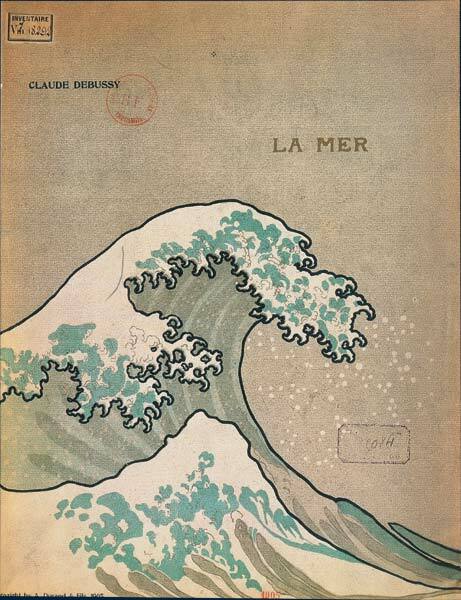 In La Mer, Debussy drew inspiration from the famous Edo-period woodblock print by Hokusai showing match-stick boats being tossed violently between monstrous waves. It’s a striking, kinetic, tumultuous image; it’s also highly naturalistic and, in a quintessentially Japanese way, defined as much by its negative space as by the turbulent action depicted. Debussy even went as far as to include a part of this image on the cover of the 1st edition of the score (below). Debussy’s fascination with the East, particularly Japan and Indonesia, seems to be of a different sort than the exoticized thrill that surrounded much of the 19th century’s engagement with “the Orient.” Indeed, Debussy’s aesthetic orientation resonated deeply with the music and visual arts of Japan and, although to my knowledge the composer never attempted a style japon, his “glue-less” musical language bears striking similarities to the traditional Japanese arts. Much of Debussy’s music eschews forward-thrusting, teleological development in favor of a static, sensual present. He courted stillness in a way that rubbed up against the maximalist tendencies of some of his (non-Gallic) contemporaries. 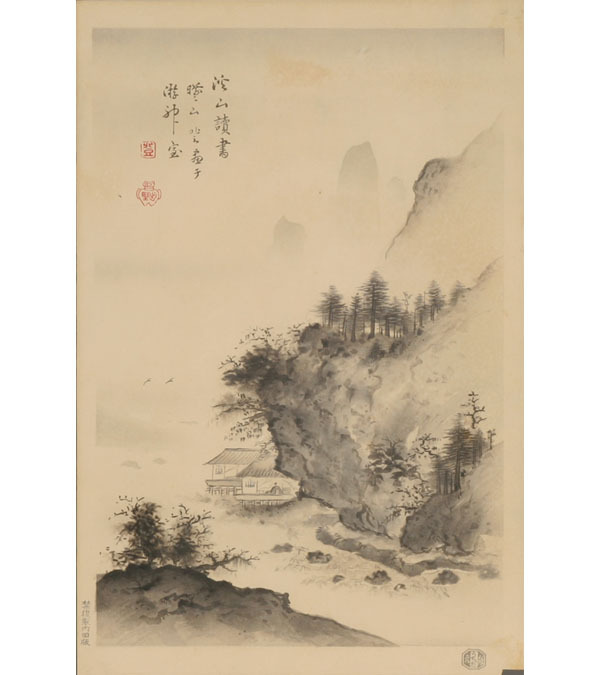 In Japanese, this sensibility towards space is called ma (間), and can be seen everywhere from ukiyoe woodprints to garden design, flower arranging (ikebana) to shakuhachi music. It was a sensibility that Debussy shared. In addition, the composer was exquisitely sensitive to tone color; a piece like La Mer employs a broad, subtle timbral palette that is, in many ways, much more spatial/environmental than structural. This too has an analog in Japanese music. The shakuhachi honkyoku tradition, for example, is carefully attuned to the aesthetics of “the single tone.” Rather than focusing on the relational “glue” binding phrases and sections within each honkyoku piece, players focus on sound itself as the most important single parameter of the music. This attitude is best summed up by the adage ichion joubutsu (一音成仏), “with one sound, one attains Buddha-consciousness.” In other words, the sound’s the thing, not the syntax. This idea probably would have resonated with Debussy, who once remarked that he loved development sections during symphony concerts because they gave him an opportunity to go out and enjoy a cigarette.